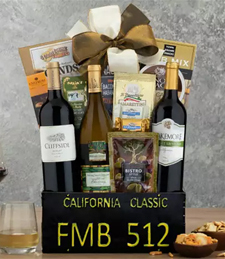 "This wholesome gift basket is filled with a collection of the ripest fruit and the most requested Wine Country gourmet fare. Two of each of your favorite fruits: fresh, crisp apples, creamy, mouth-watering pears and sweet, juicy oranges arrive at their peak ripeness. 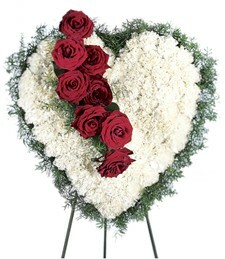 Complementary items include sesame crackers, asiago cheese spread, Godiva creme brulee truffles filled with caramel and creamy white chocolate ganache, honey mustard pretzels, Mama Mellace's dried fruit and nuts, chocolate peanut butter malted milk balls and Lily O'Brien's chocolate chip cookies." 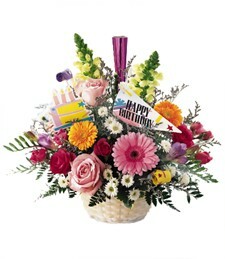 "This sweet tower is the perfect way to send your greetings, say thank you or convey countless other well wishes. Decorative boxes are filled with a collection of Godiva truffles including milk chocolate, creme brulee, lava cake and dark chocolate, butterscotch candy, yogurt pretzels, assorted Lindt dark chocolate, milk chocolate and extra dark chocolate truffles, caramel popcorn, Italian milk and extra dark chocolate hazelnut pralines, candy apple caramels and Pirouline chocolate hazelnut wafers. 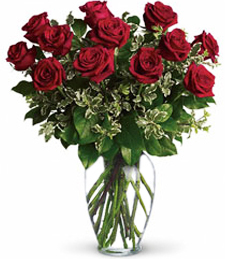 They will love everything about this distinctive gift tower." This golf cooler bag is filled with artisan salame piccante, Napa Valley Mustard Company stone ground mustard, garlic herb cheese spread, toffee almonds, dark chocolate Piroulines, sea salt olive oil crackers, dried fruit and nuts, cinnamon roasted mixed nuts, mozzarella cheese swirls, peanut crunch , a bamboo cutting board and cheese knife so they can begin enjoying this gift immediately. 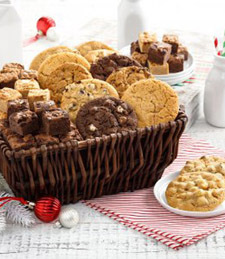 Mini-versions of your favorite cookies and a basket for sharing them. Contains 72 Nibblers� bite-sized cookies. 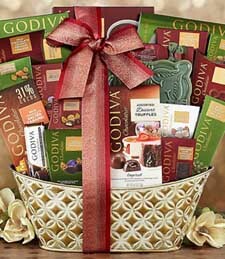 This elegant chocolate basket is filled with Godiva milk chocolate salted caramel and dark chocolate truffle bars, dark and milk chocolate hot cocoa, a collection of truffles including milk chocolate, white chocolate, dark chocolate, creme brulee, chocolate lava cake and strawberry cheesecake, milk chocolate covered raisins, dark chocolate squares, milk and dark chocolate Bavarian pretzels, chocolate truffle coffee, milk chocolate salted toffee caramels, a candy dish and more. 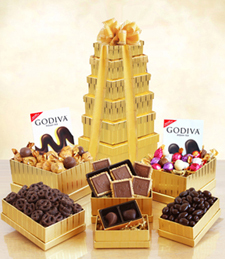 Velvety chocolate abounds in this gold tower of Godiva riches. 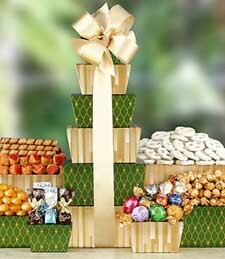 Our dazzling tower is overflowing with sumptuous chocolates for a truly spectacular treat. 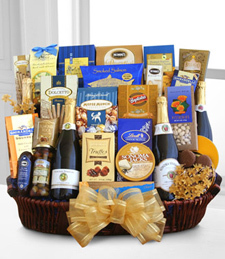 Satisfy that chocolate craving with an assortment of Godiva chocolate truffles, chocolate-covered pretzels, a signature gold Godiva box of assorted chocolates, Godiva signature biscuits, and dark chocolate almonds. 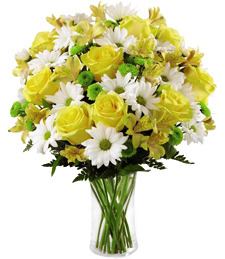 It�s the height of indulgence. 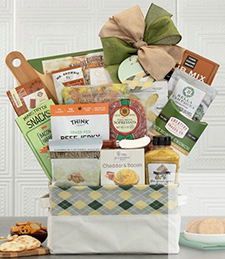 Make any event a festive celebration when you send this over-the-top gift basket that's filled with everything that's oh, so good! 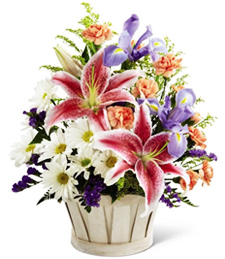 Indulge your favorite group of revelers. Four bottles of Sonoma sparkling cider, Bruschetta crisps, beef sausage, a decorative tin of chocolate-covered sandwich cookies, Bellagio hot cocoa mix, toffee almonds, smoked salmon, Sonoma Jack cheese, truffles, almond roca, cheese crisps, gourmet stuffed olives, water crackers, Ghirardelli� chocolate caramel squares and milk chocolate bar, cheese straws, Lindt truffles, pistachios, Dolcetto rolled cookies, Nonni's biscotti, English tea cookies, Harry & David Moose Munch, and white chocolate macadamia nut cookies. 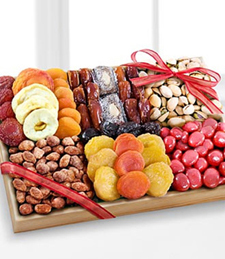 The Season's Snacks Holiday Dried Fruit, Nuts & Sweets Tray sends your warmest wishes to friends and family throughout the Christmas season! 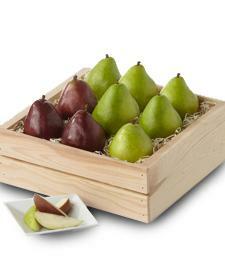 A wooden tray with carved handles arrives carrying an array of gourmet goodies, including: 1-lb, 6-oz, dried fruit (apricots, pears, angelino plums, apples, blenhelm apricots, prunes, dates, date nut rolls coated with coconut), 5-oz. cinnamon toffee almonds, 4-oz. roasted salted pistachios in the shell, and 6.5-oz. chocolate covered dried bing cherries. 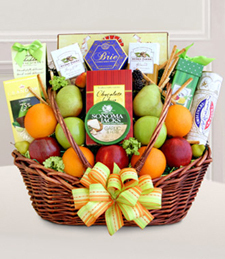 Presented tied with a festive red ribbon, this gourmet gift basket will delight your special recipient and add to the joy of their season with each mouthwatering bite. 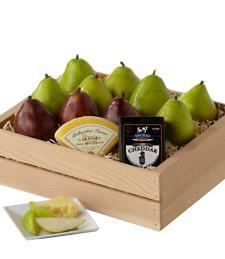 Healthy wishes abound with this large array of fresh fruits and treats to share with the entire group. 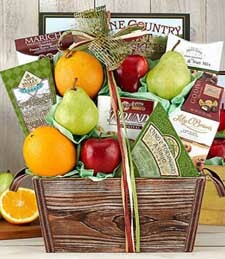 This basket is packed with crispy apples and pears, juicy oranges, Sonoma Jack cheese, English tea cookies, focaccia crisps, Columbus salami, Sonoma cheese straws, almonds, creamy Brie cheese, crunchy snack mix and an organic chocolate bar.